Palestinians riot on the Israel-Gaza Strip border, Aug. 3, 2018. Photo: Reuters / Ibraheem Abu Mustafa. 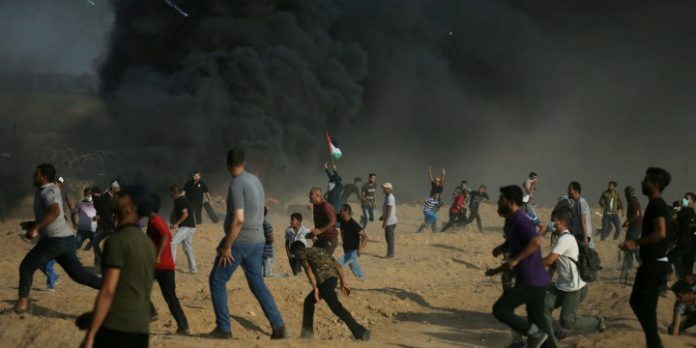 IDF troops killed one Palestinian rioter and wounded more than 200 others at a weekly protest on the Israel-Gaza Strip border on Friday, Palestinian health officials claimed. Rioters rolled burning tires and hurled stones toward the Israeli soldiers and the border fence, according to witnesses. The Israeli military said that some threw firebombs and a grenade. No Israelis were hurt. Reuters television footage showed incendiary kites in the air being sent toward Israel. An Israeli military statement said soldiers had used riot dispersal means and acted “in accordance with standard operating procedures.” Israeli aircraft also struck two Hamas outposts, the military said.